Like oxygen, water passes easily into and out of cells through the cell membrane. Osmosis is the diffusion of water molecules through a selectively permeable membrane. Because cells cannot function properly without adequate water, many cellular processes depend on osmosis. Remember that molecules tend to move from an area of higher concentration to an area of lower concentration. In osmosis, water molecules move by diffusion from an area where they are highly concentrated through the cell membrane to an area where they are less concentrated. 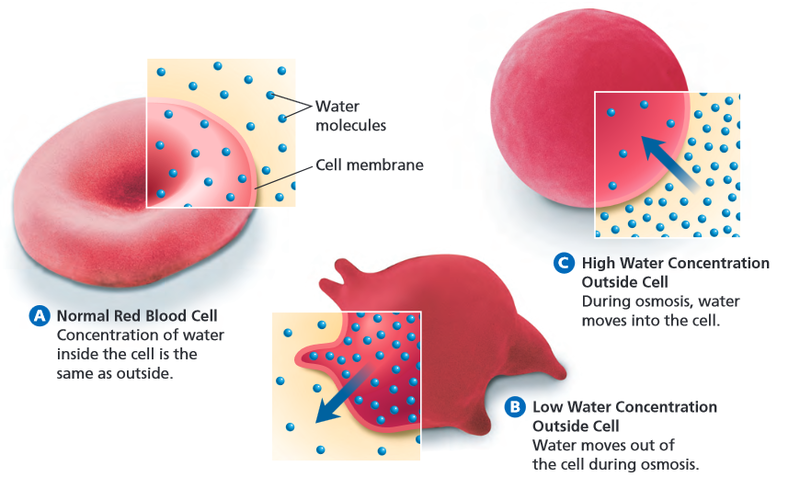 A red blood cell is bathed in a solution in which the concentration of water is the same as it is inside the cell. This is the normal shape of a red blood cell. Contrast this shape to the cell in Figure 24B. The red blood cell is floating in water that contains a lot of salt. The concentration of water molecules outside the cell is lower than the concentration of water molecules inside the cell. This difference in concentration occurs because the salt takes up space in the salt water. Therefore, there are fewer water molecules in the salt water outside the cell compared to the water inside the cell. As a result, water moves out of the cell by osmosis. When water moves out, cells shrink. In Figure 24C, the red blood cell is floating in water that contains a very small amount of salt. The water inside the cell contains more salt than the solution outside the cell. Thus, the concentration of water outside the cell is greater than it is inside the cell. The water moves into the cell, causing it to swell.